Now and again a team catches the imagination of football fans around the world, for one reason or another. A couple of years ago it was number-crunching Danish team Midtjylland and around about this time last season, millions of people around the world were struggling with the correct pronunciation of the high-flying foxes from Leicester. This season it is RB Leipzig – which although slightly easier on the tongue, the claim that RB stands for RasenBallSport rather than a sickly Austrian energy drink, is difficult for many to swallow. RB Leipzig’s rise through the German leagues and their brief occupation at the summit of the Bundesliga has not gone unnoticed. And although there has been almost begrudging admiration and praise for the youthful, attractive and attacking brand of football, as well as the leadership of the highly-regarded Austrian head coach, Ralph Hasenhüttl, the majority stand on the other side of the fence. The well-documented nature of the club’s existence has left a sour taste in the mouths of fans, journalists and others in the game – so much so that RB Leipzig rank among one of the most hated teams in European football at the moment. Red Bull had been associated with sport long before RB Leipzig appeared, with a particularly successful presence in formula one. And of course, Germany isn’t the first place a Red Bull-owned football club has been seen. The company’s co-founder Dietrich Mateschitz was the driving force behind the emergence of Red Bull Salzburg in Austria, the New York Red Bulls and Reb Bull Brasil, located in São Paulo. Aside from the name, all of these three teams have one thing in common: they all previously existed under different names. Put simply, Red Bull scouted out the locations, found a struggling team, took them over, slapped a couple of bulls on the club’s badge, and there you go – a new football team. In Germany, though, it wasn’t so easy. The company searched for a few years, apparently initially favoring Hamburg, Munich and Düsseldorf but there advances to teams in those cities were giving the cold shoulder. To cut a long story short, Red Bull were pointed in the direction of Leipzig. And although their modus operandi was initally knocked back by the German Football Federation (DFB), who wouldn’t allow a club’s name to be changed for advertising purposes, Red Bull was sold on the prospect of Leipzig – a football city with no Bundesliga club of its own, or even one close by. To get around the DFB’s rules, they would have to acquire the playing rights of a club outside of its reach – in this case the fifth tier. The club in question was SSV Markranstädt, from a village a few kilometers west of Leipzig, and it didn’t take the suits at Red Bull to get the deal done. Just a few weeks after negotiations began, the Markranstädt sold its playing rights, leading to the genesis of RasenBallsport Leipzig – the name avoiding any problems with the DFB while still ensuring the club would be commonly-known as RB Leipzig. It is fair to say that the birth of Die Bullen was not wildly celebrated and the ill-feeling has only snowballed since. Nevertheless, fast forward a few years, and Hasenhüttl’s work to date should be admired. He may have only been in the job since the team reached the Bundesliga, but Hasenhüttl has himself climbed through the leagues. After cutting his teeth as a youth coach at SpVgg Unterhaching in 2007 in the newly-formed 3. Liga, he moved to VfR Aalen, where he went from saving the team from dropping into the regional leagues to creating an established 2nd division team in less than three seasons. On the back of this he was appointed head coach at fellow 2nd division team FC Ingolstadt who he took to the Bundesliga and finished mid-table in their first ever season in the top flight. Impressive stuff. And in taking RB Leipzig to the top of the Bundesliga in the first half of the season he has raised his stock further – so much so that he has already been touted by some as a potential successor to Carlo Ancelotti at Bayern Munich. But what was the footballing landscape in Leipzig before the Austrian energy-drink machine rolled into town? Despite the corporate nature of the city’s current main representative, Leipzig is steeped in football tradition and can legitimately lay claim to be the home of German football. Not only was the German Football Federation, the DFB, founded in Leipzig in 1900, but the city’s very own VfB Leipzig were crowned league champions in the DFB’s maiden season in 1902/03 and were also proud occupants of the Wacker Stadion, the country’s first large football stadium in 1922. In the early years of the 20th Century, up until WWI, VfB emerged as one of the country’s top teams, finishing as champions three times and being there or thereabouts almost every season. The outbreak of war meant football stood still and the city, and by proxy the club, were heavily affected. Around half of VfB’s club members served in the army and four players from the 1913 championship-winning team lost their lives. As the country began to rebuild itself post war VfB moved into a new stadium with space for more than 40,000 fans – a physical symbol of their place in the nation’s footballing hierarchy. As it turned out, though, the new stadium was more a reflection of where the club had stood before the war as restoring past glories and reconstructing a team ripped apart by the war proved difficult. Pre-Bundesliga, football in Germany was played in a very fragmented landscape, and Leipzig, along with the rest of Saxony, and the other federal states Saxony-Anhalt and Thuringia made up the Mitteldeutsche Fußball Meisterschaft, the Central German Football Championship, of which VfB Leipzig are the most successful team, with a total of 11 championships. The Nazi’s rise to power, however, led to the creation of the Gauliga system in 1933 whereby Germany’s football clubs were funneled into 16 (later 18) newly-established regions of the Third Reich. The majority of the Gauliga period passed by uneventfully for Leipzig, with the team hovering between mid-table and relegation – but 1936 saw a throwback to more successful times. VfB reached the final of the German Cup, then called the Tschammerpokal, where they faced FC Schalke, one of the country’s dominant forces at the time. The 4,000 or so fans that made the journey from Leipzig to Berlin were hopeful that David would overcome the Goliath of the Königsblau and couldn’t believe their eyes as Leipzig brought home the cup after an improbable 2-1 victory. The Gauliga system lasted only eleven seasons before being interrupted by WWII and the fall of the Nazi Party and subsequent Soviet occupation. Once again, the country’s socio-political landscape had shifted, and sport was swept along by the current of change. 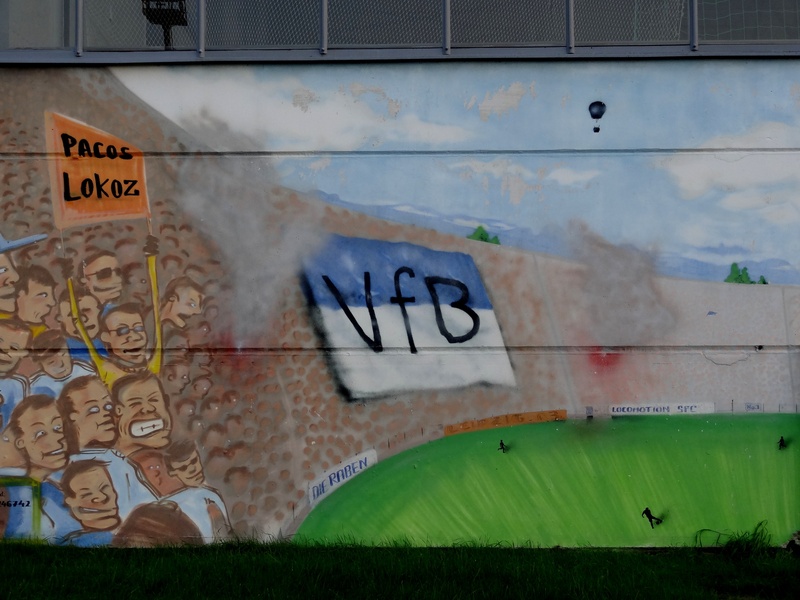 Football clubs, as with many organisations in the country, were dissolved by the occupying Allied authorities and the VfB Leipzig of pre-WWII was no more. The city, once again scarred by war and under Soviet occupation had to find a new footballing identity. Forming a new club was anything other than straightforward as all real or imagined links to the Nazi regime were being cleansed. A new club could only include players that were residents of the district where the club was housed, for example. Nevertheless, SG Leipzig-Probstheida, named after the district of Leipzig, rose from the ashes of the war thanks to players and representatives of the now defunct VfB Leipzig and sought to re-enter the country’s footballing pyramid. Over the next few years the name changed to BSG Erich Zeigner, named after the ex-Prime Minister and prominent anti-Nazi voice, and then BSG Einheit Leipzig Ost, under which name the club won promotion to the DDR Oberliga, the top flight in former East Germany. Shortly after though, Leipzig’s football clubs were once again dissolved and the city’s footballers were filtered into new ones – SC Rotation Leipzig and SC Lokomotive Leipzig. With both of the new clubs playing in the top league in the former east, Leipzig had become a two-club city. Both teams enjoyed moderate success in terms of league position but it was Lokomotive who won the race to silverware, lifting the FDGB-Pokal, the East German Cup, defeating Empor Rostock in extra time. The city’s football identity may have been in a period of near-constant flux, but Leipzig’s football fans bought into their new clubs – so much so that a 1956 derby between Lokomotive and Rotation attracted more than 100,000 fans to Leipzig’s vast and deep-set Zentralstadion, still a record in Germany. But as quickly as the city’s footballing duopoly began to cement it was again interrupted. The level of success was not deemed appropriate for the east’s second-biggest city and the creation of a new club, SC Leipzig, was seen as the answer. Although it was supposed to be a combination of the Lokomotiv and Rotation, the reality was slightly different. The best players from both clubs made up the new team whereas those who remained were left to form yet another club, BSG Chemie Leipzig. In essence, Leipzig had cannibalized the city’s football clubs, cherry-picked the top players to create a Leipzig XI and left ‘the rest’ to fend for themselves. Again, the Leipzig’s fans had to choose, and the rivalry formed anew – perhaps this time even more intensely thanks to the sense of injustice followers of BSG Chemie would have been entitled to feel. Nevertheless, despite SC Leipzig reaching the cup final in their first year it was the best of the rest at BSG that finished the season as champions, suggesting that maybe something went a little awry with the selection process. Before the dust could settle on another cross-town rivalry, the trigger-happy powers that be introduced new reforms, again with the goal of establishing better parameters for the game to flourish in the east, and again manifesting in the formation of a fresh club. So it was out with the not-very-old and in with the new – well, kind of. As of 1966 SC Leipzig was no more, replaced by 1. FC Lokomitive Leipzig – the name, as with predecessor SC Lokomotive, coming from the Deutsche Reichtsbahn, the German State Railway. Leipzig was, after all, a major hub for German rail, and the 1. FC Lokomotive players were technically employees of the railway. For many critics of today’s RB Leipzig, the only thing approaching a saving grace is their philosophy of playing young players and advocating fast, dynamic football. This was also the case in the early days of 1. FC Lokomotive, often referred to as FC Lok, thanks to the construction of a new football academy in their district of the city providing them with a conveyor belt of talent, many of which went on to represent East Germany at national level. The swinging sixties saw FC Lok make their first foray into European competition. In 1966 they won the Intertoto Cup, East German team to grab the ears of a European trophy. And despite only making it to the fourth round in the short-lived Inter-Cities Fairs Cup in the same year, Lokomotive turned some heads by knocking out Eusebio’s Benfica over two legs the round previous. Over the next 20 years or so FC Lok began to establish themselves in the Oberliga and form a real identity as a strong cup team, reaching eight finals between 1970 and 1987 and winning half of them. Part of the club’s emerging character involved them becoming infamous for turning on the style in mid-week European football and turning in frustratingly inconsistent performances in the league on a Saturday. And this penchant for all things continental led the team to arguably their greatest hour, a place in the final of the 1987 UEFA Cup Winner’s Cup where they faced off against Johan Cruyff’s Ajax featuring the likes of Frank Rijkaard, Marco van Basten and a teenage Dennis Bergkamp. Despite being overwhelming underdogs, FC Lok gave a good account of themselves before ultimately falling to a first-half van Basten header. Once again socio-political actions superseded sport and as the Berlin Wall fell and people streamed into the west, the country’s football merged. Aside from Hansa Rostock and Dynamo Dresden, who joined the Bundesliga, teams from the DDR Oberliga were designated a place in the 2. Bundesliga which was extended to 24 teams to accommodate the newcomers. However, the new-look 2. Bundesliga had a few growing pains with the bloated new system. To keep the season from becoming too drawn out the league was split into two, both containing 12 teams, but this didn’t suit everyone and it took until the 1994/95 season before the league settled on 18 clubs. But to rewind a couple of years before Leipzig took its place in the new national league, another important decision was made. The club decided to revert back to the name VfB Leipzig – part of the thinking being to revive memories of past glories. Initially it seemed to do the trick as VfB were promoted to the Bundesliga in 1994, but the club came straight back down and bobbed around mid-table for a few seasons before sinking down into the Regionalliga Nordost, and just two seasons later the Oberliga Nordost – at the time the third and fourth tier respectively. The end of the 20th century also saw mounting problems off the pitch. The high turnover of players and coaches in an attempt to cling on to and later regain Bundesliga status led to an ever-growing chasm between profit and loss in the club’s books and VfB entered administration in 2000, by now playing and operating light years away from a Bundesliga level. Eventually, in 2004, just over one hundred years after being crowned Germany’s first-ever league champions, VfB Leipzig ceased to exist. However, if the previous century had proven anything, it was that Leipzig’s soil is fertile ground for football clubs and new shoots quickly began to emerge. This time it was in the form of a small group of VfB fans, who resurrected 1. FC Lokomotive Leipzig, last seen on the eastern side of the Berlin Wall over twenty years previous. The new-look FC Lok absorbed both the women’s team and the youth teams of VfB but the first team had to start from scratch, and that meant for new trainer Rainer Lisiewicz – himself a former FC Lok player in the 60s and 70s – putting together a completely new team to kick off in the 3. Kreisklasse, at the time the eleventh and lowest rang of the footballing ladder. Despite the lowly statues, FC Lok were still able to call the Bruno-Plache-Stadion home, and as the natural heir to VfB Leipzig, they had the support to fill it. Of course, a club this size stuck out like a sore thumb at that level and the nationwide media attention only enhanced their cult status in and outside of Leipzig. Parallels can of course be drawn with AFC Wimbledon and FC United of Manchester in England, the latter visiting for a friendly game in 2006. Whereas there was a general groundswell of good feeling for the club, FC Lok has its problems, and not of an insignificant nature. The club has been used as a platform for far-right fan groups to air their political views and although they have officially banned the group from the stadium and publicly distanced themselves, a connection still lingers in the background and has more recently come to the fore against the backdrop of Germany’s refugee issues. By 2008 the club had climbed halfway up the ladder to the NOFV-Oberliga Süd, the fifth tier. It was here, a season later, Leipzig’s newest derby would take place as 1. FC Lokomotive Leipzig came up against RB Leipzig, in the latter’s inaugural season. For the record, RB Leipzig won the match comfortably 3-0, and went on to breeze through the division on their way to bolting through the leagues. In that season Leipzig’s clubs (including Sachsen Leipzig, the team RB tried to take over) passed like ships in the night, sailing in different directions. But although FC Lokomotive, like so many at their level, are still in a constant battle to keep the wolf from the door, and must now compete with the emergence of RB Leipzig for hearts, minds and bodies through the turnstiles, football fans in Leipzig can be grateful the club exists at all.